Prime Minister Narendra Modi has a packed schedule in Manila. The PM, who arrived in the Philippines on Sunday, is here to attend the ASEAN-India and the East Asia summits. On his second day of the visit, Modi visited the International Rice Research Institute in Los Banos, an urban locality situated at a distance of around 65 km from Manila -- the capital of the Philippines -- and then visited the Mahaveer Philippine Foundation, that provides free Indian-made prosthesis ‘Jaipur Foot’ to needy amputees. Here are images from Modi’s second day in the Philippines. Prime Minister Narendra Modi visits the International Rice Research Institute. During his visit to the institute, PM Modi was informed of the flood-tolerant rice varieties which can withstand 14-18 days of submergence and can provide 1-3 tonnes more yield per hectare in flood affected areas. 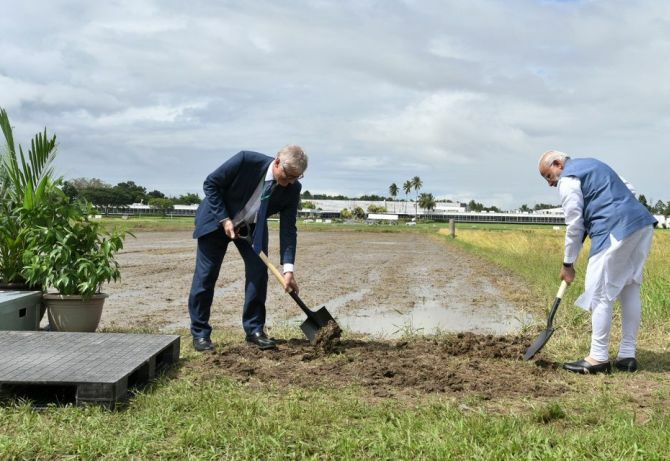 The Indian government is also setting up a regional centre of the IRRI in Varanasi, the Prime Minister’s constituency, to develop high-yielding rice varieties. A ‘rice field laboratory’ named after Prime Minister Modi was also inaugurated by him at the institute. 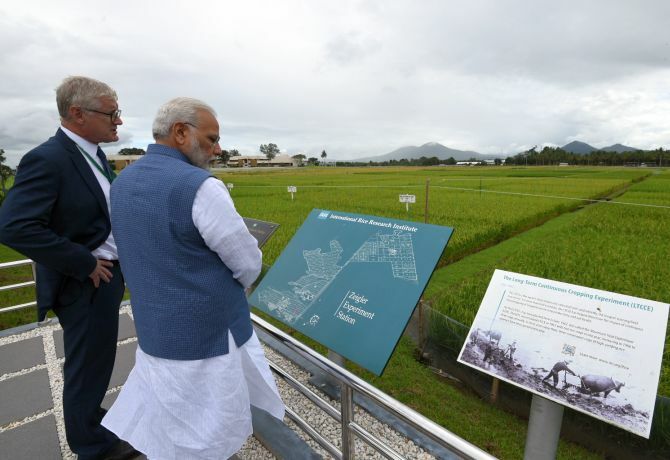 The PM also unveiled a plaque marking the inauguration of the Shri Narendra Modi Resilient Rice Field Laboratory. 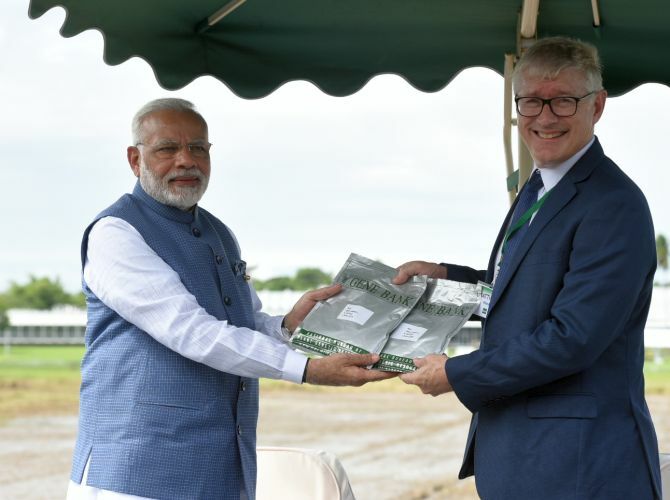 Prime Minister Narendra Modi also contributed two Indian rice seed varieties to the gene bank of the international rice research centre in the Philippines. The centre is working towards mitigating global poverty and hunger by improving the cultivation of the key grain. 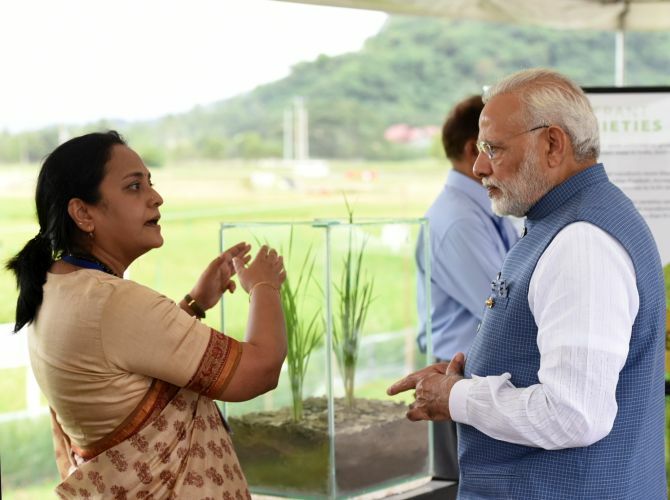 Dr Ranjitha Puskur explains to PM Modi about the support provided to women for transforming agriculture. IRRI and its partners provided 2, 00, 000 women farmers in Odisha with capacity building programs, stress-tolerant rice varieties and improved agriculture technology. 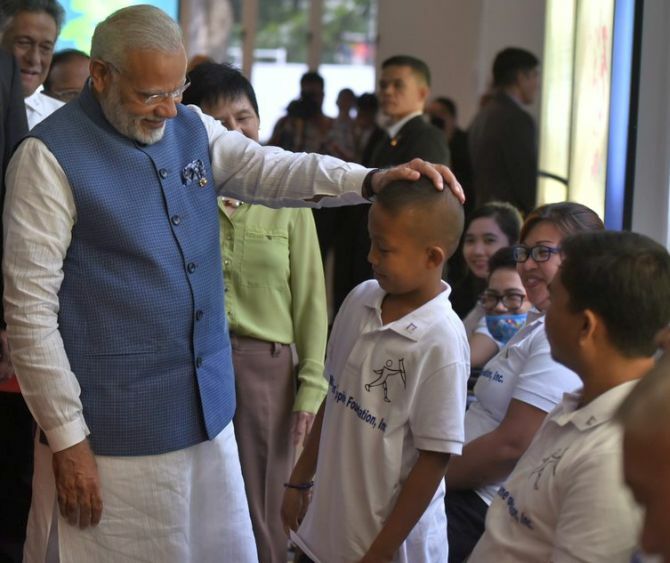 After his visit to the rice centre, Modi then made his way to the Mahaveer Philippine Foundation, a long-running humanitarian cooperation programme between India and the Philippines. The foundation was set up by highly regarded Indian–origin Mayor of Manila Dr Ramon Bagatsing in 1985. The organisation is an associated centre of Jaipur-based Bhagwan Mahaveer Viklang Sahayata Samiti which is the world’s largest organisation rehabilitating over 1.55 million differently-able people through ‘Jaipur Foot’. 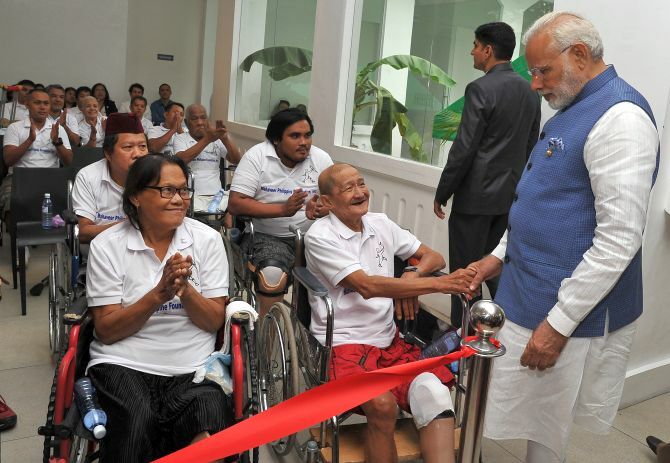 Modi also interacted with the several amputees at the centre. He tweeted the above image, writing, "'I want to be a policeman’ my young friend told me... Glad to see the Jaipur Foot giving wings to the aspirations of many youngsters like him." Earlier in the day, PM Modi attended the opening ceremony of the ASEAN summit at the highly fortified Cultural Centre. 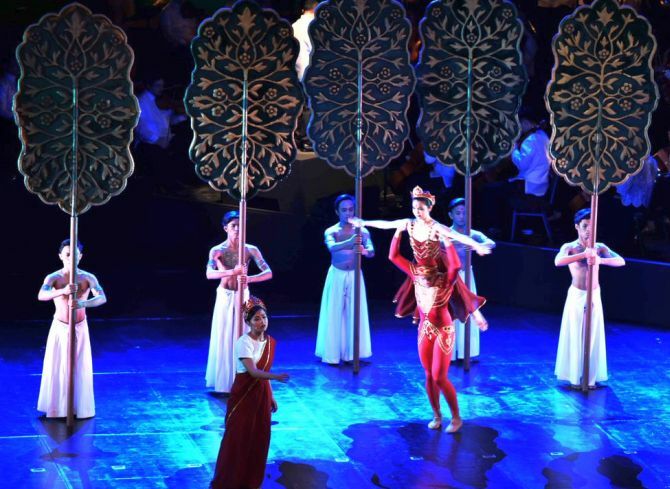 World leaders including Prime Minister Narendra Modi, US President Donald Trump, Chinese premier Li Keqiang, Japanese Prime Minister Shinzo Abe, were welcomed with a musical version of the epic Ramayana. PM Modi and US President Donald Trump meet on the sidelines of the ASEAN Summit. 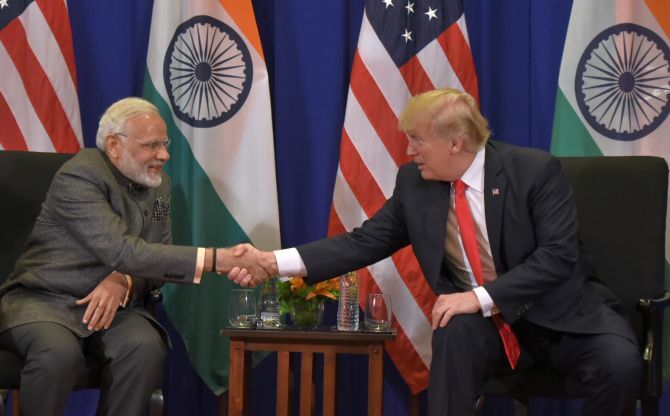 Following his meeting, Modi said, "The relations between India and the US are growing... and I also feel that the relationship between India and the US is not only for mutual interest. It goes beyond that. We are working together for the interest, for the future of Asia and for the humanity as a whole in the world." The PM also thanked Trump for praising India whenever he got an opportunity to speak about the country during his Asia tour. What does Modi really believe in?